∼ 2013 ∼ January ∼ 06 ∼ Vitamix Blender! Last year, for Chris and my 5 year wedding anniversary, he bought me quite possibly the best gift I have EVER received. EVER! My Vitamix Blender!!! The Vitamix is a super high powered blender that can blend pretty much anything it’s faced with. It has been known to pulverize rocks into fine sand. No joke. 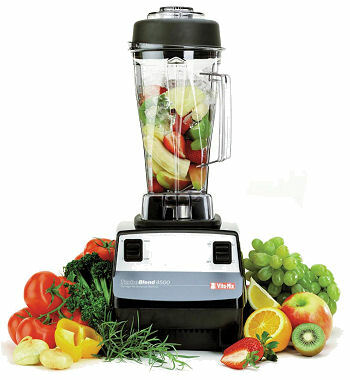 So needless to say, it has no problem blending delicious fruits and vegetables into yummy, velvety smoothies and juices. It creates mouth watering soups and salsas in minutes and fresh hummus is only moments away. That is just a small fraction of what the Vitamix can do. With this amazing machine on your counter, your life will be full of healthy concoctions including nut milks, dips and spreads, salad dressings, nut butters, frozen desserts, flours, batters, baby food, purees… It is limitless! I have owned this beautiful blender for well over a year and can honestly say I have used it just about every day. Several times a day, making this machine well worth its hefty price tag (between four and five hundred dollars). It has a 5-7 year warranty, depending on your model, and is handmade in the USA. Quality and customer service is extremely important to the Vitamix Family so any of your concerns are always taken seriously. I believe if a Vitamix was placed in every home in America that we would all be loads healthier and weigh quite a bit less. Let’s make 2013 a start to a healthy new you! Pick up your Vitamix Blender TODAY! Happy New Year! OMG OBSESSED! *Check back for recipes! I have lots to share!! !